Meth and marijuana were reportedly seized from a woman’s vehicle last week after the Maricopa Police Department pulled her over for cancelled insurance. Guillerma Perez, 40, was arrested July 18 around 2:15 p.m. near Roosevelt Avenue and Jackrabbit Trail in Alterra after an officer smelled marijuana and performed a search, according to a Maricopa Police Department report. Perez allegedly admitted to having three bags of cocaine, which later tested positive for 13 grams of methamphetamines, in her vehicle. A pipe and a scale were also reportedly discovered. The officer later located 14.5 grams of marijuana hidden behind a plastic panel of the car’s center console near the floor board, according to the report. “(Perez) stated the methamphetamines belonged to someone else and (she) was on her way to drop off (sic.) the methamphetamines and scale to an unknown person residing near Maricopa High School,” the report states. The marijuana belonged to Perez’s neighbor who had been recently borrowed her car, she allegedly told police. Perez denied knowing the marijuana was in her vehicle nor where it was located. 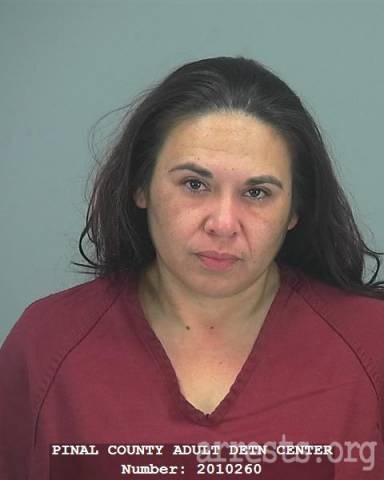 Police booked Perez into Pinal County Jail on suggested charges of possession of dangerous drugs for sale, a class 2 felony; possession of marijuana for sale, a class 4 felony; and possession of drug paraphernalia, a class 6 felony.